Summon: Another creature disappears, then returns at the end of the turn. Winterhold Illusionist is a common Willpower creature card. It is part of the Heroes of Skyrim expansion. His ability is, in essence, an unsummon and resummon effect, thus removing any buffs and/or damage, and triggering any Summon abilities. It could also be used to temporarily remove a Guard creature to give your creatures a chance to attack your opponent. In addition to the card's availability in the Heroes of Skyrim expansion, three copies are included in the Ancano's Cunning theme deck. "The Illusion mage is never as he seems." 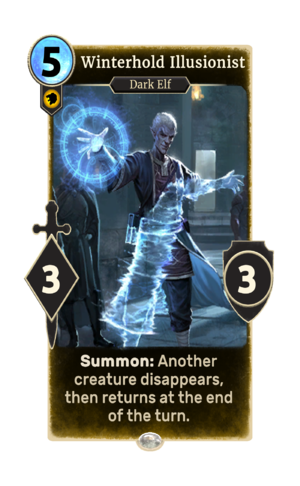 This card depicts Drevis Neloren from Skyrim. This page was last modified on 27 February 2019, at 22:59.